Hello, where can I find on selected image info about actual original size? For example: I placed a picture, somehow diminished its size. And now I need to know what size it has to the original size (like 88.3%). Click the image and change to the Move Tool. Look at the top left of the interface after the layer's name in the context toolbar. You can also get this and more info going to menu Document▸ Resource Manager and selecting the image from the list. The Transform panel also indicate the (current) image dimensions on canvas when it's selected. The Transform panel also indicate the image dimensions when it's selected. Thank you. But this info is not what I need. When I return to the image after a time when its size has been modified differently, and now I need to have it back to its original size. How can I do this if I do not know its original dimension? See, what I mean in InDesign, pls. Currently one can only find the original size in the resource manager. However, that is next to useless versus seeing the percentage of size adjustment. Both the information on the top left of the screen (context toolbar) and the Resource Manager refer the original image size as said (for placed images - that is, image layers). Pixel layers is a different thing. Only the Transform panel (and Resource Manager) gives the current image size on canvas. Currently it's not possible to get the percentage in relation to the original size anywhere (other than do the math). Yes, like in AD. I was mistaken that the Resource Manager also displayed the scaled percentage...but that was in something else. And both have the same issue when trying to get a resized image back to its original size using the transform panel if going by a pixel dimension resize. If I have an image that is 800x535 px that has 180dpi written into it when placed at 100% size, resize it and try using the transform panel to resize it back to that dimension using the pixel dimensions that is displayed, it is much smaller. Having the percentage an image is scaled available and being able to modify the current size based upon that percentage is a definitely a should have feature. I’ve been using DP software for more than 20 years and I can state that for any important publishing project the % of the imported images are extremely important, I would say they are mandatory. You cannot ask users to calculate the % from the image sizes in pixel, it is an enormous waste of time when, for instance, the layout includes hundreds of pictures. However, I’ve just starting testing the software and I think you have done a great job, though the way it handles pictures is probably the field where you need to implement the most. You cannot ask users to calculate the % from the image sizes in pixel, it is an enormous waste of time when, for instance, the layout includes hundreds of pictures. I agree with all this. I just started using Publisher on a small project and I find it hard to managing sizing of objects of all kinds if percentage isn't part of the tools. It could be in the Transform panel or even in the contextual toolbar, and not just for images but all items. not just for images but all items. Percentage of what though? The concept of "original size" is somewhat ambiguous to begin with and for many type of objects is completely meaningless so there would be nothing to calculate a percentage of. For images you seem to be asking for a percentage of the size that is calculated from the DPI and pixel resolution settings stored in the image file (which assumes a file type that contains such data), but those values can easily be arbitrary so they may not reflect the size of the pictured objects at all. Then take artistic text. What is the "original" size of artistic text? If you argue that it is the original size from when it was first entered, what happens when I change the font to one with different metrics? Scale the text then modify it - do the newly typed characters have a different "original size" than the ones that were there originally? If you go with the definition of pixel count divided by dpi, then that can work for images if the dpi was originally set to something meaningful for the image, though the usage of the term is somewhat fuzzy - but it doesn't exactly apply to "all items" in a meaningful way regardless. Unless you're trying to do, for example, architectural designs that needs to show the scale (1" = 1', etc.) I really don't understand why the percentage is important to you. If that's not your situation, can you help me understand this, please? To me, I have a project with pages of a particular size, and picture frames that are the size I want my printed images to be, and I fill the frames. At that point I don't find the original sizes of the images to be relevant or useful. So, obviously, my work methods are different from yours (and some others in this thread) and I'd like to understand that other workflow better. I think if you read the rest of the forum you'll see why it's essential to many people. You don't need to understand it or need it yourself, just accept that a lot of people require it. I work at a printing company and often need to be a lot more precise in measuring things. Percentage comes into play there. If I place one image and then manually have to make it smaller, then place a second image that needs to be scaled down the same amount, how can I tell by how much the first image was scaled down? With InDesign, I would select both placed images and then change the percentage to 25% (for example). Percentage also comes into play when I am creating different sized versions of the same file (say, different sized posters), so I can make sure in the new size that all elements are scaled properly. There are of course work arounds in Publisher but it takes more time and as posted above, sometimes requires doing the math manually. fde101 above says "percentage of what?" - this would be a percentage of the current size. So if a box is 2x2 and you choose to scale by 200%, then the box increases to 4x4. Now the 4x4 size is considered 100% for that object. Photos are the same except dpi is involved. I would select both placed images and then change the percentage to 25% (for example). are you aware that you can type in mathematical expressions in the transform panel? For example, if the width field of an image displays 2400px you can type in (or add after) '2400px*25%' and hit ENTER. This scales the image's width to 25%. If you lock aspect ratio before, this works for the entire image. Thanks dom I am aware of that. Like I said, it is possible to get the desired outcome, it just is not as quick or convenient as having a direct percentage. this would be a percentage of the current size. They are always 100% of their current size, so that is trivial to figure out. 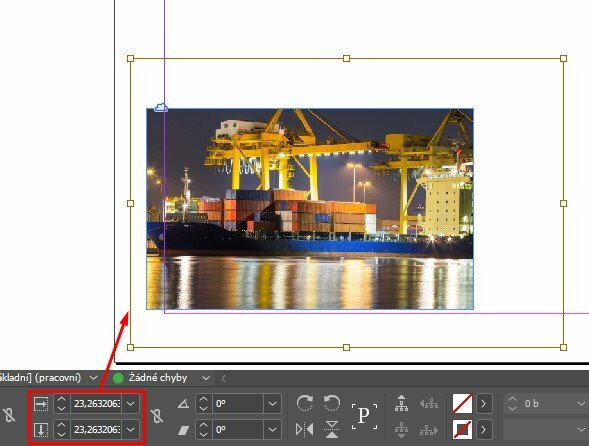 To double the size of an object, make sure width and height are linked in the transform panel, select one of them and type "* 2" and press return/enter. To halve it, use "/ 2". Similarly, "* 1.5" to add 50% to the size, etc. Or w+50% if you want to think in percentages. You can actually just type in 150% too.